“The stars aligned, and the timing was perfect,” says Parker, Houston's former mayor, of the job offer. Victory Fund is getting a change in leadership. 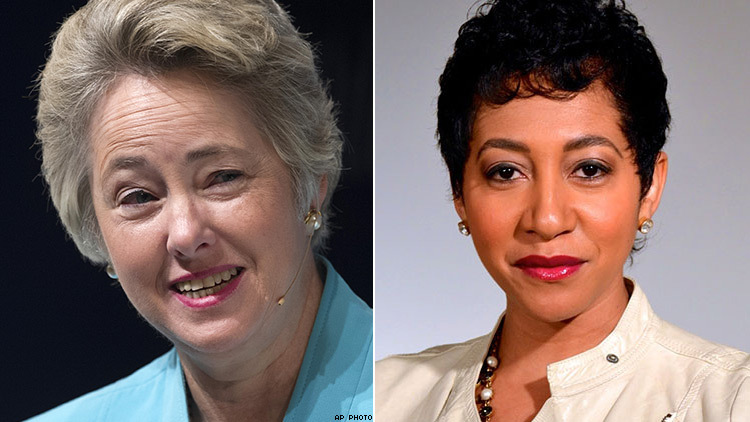 Aisha C. Moodie-Mills announced today that she’s resigning as president and CEO of Victory Fund and its sister organization, Victory Institute, and former Houston Mayor Annise Parker will take over the post Monday. The groups train and support openly LGBT candidates and elected officials at the local, state, and federal levels. Moodie-Mills did not specify what her next move will be. Victory Fund director of communications Elliot Imse, speaking to The Advocate afterward, did not offer specifics either, but said Moodie-Mills wants to work in the broader progressive movement, incorporating LGBT issues and more. She plans to move from Washington to join her wife in New York City. “With the 2018 election cycle heating up, the timing worked out for everyone,” he said. Parker wants to build on Victory Fund’s successes, she said. “We’re going to do more of the same,” she said. Moodie-Mills helped inspire more LGBT people of color to run for office, for instance, and Parker wants to continue increasing those numbers. It’s also important to continue increasing the number of transgender candidates, she said, after a year that saw some major victories for trans candidates endorsed by Victory Fund, with Danica Roem defeating anti-LGBT incumbent Bob Marshall for the Virginia House of Delegates, and Andrea Jenkins and Phillipe Cunningham elected to the Minneapolis City Council. “One of the reasons it’s really important to support transgender candidates is that there’s been a ramp-up in attacks on the transgender community,” she said. While many straight and cisgender people know someone who is gay, lesbian, or bisexual, far fewer know someone who is transgender, and that makes it easy for anti-trans forces to create an image of trans people as a “feared other,” she said. She saw that happen up close during the effort to repeal the trans-inclusive Houston Equal Rights Ordinance, which voters did in 2015. Opponents of the ordinance, which the City Council passed in 2014, ran a fearmongering campaign alleging that it would allow predatory men disguised as women to terrorize women and girls in public restrooms. “The fight over HERO was the start of a wave of very focused attacks on the transgender community,” she said. It was also a learning experience for Parker and others who support equal rights for trans people. “It was a great reminder that we have to get out early and we have to own the narrative in these political campaigns,” she said. That’s a lesson she plans to bring to her work with Victory Fund, she said, adding that greater acceptance of trans people will be transformative for the whole LGBT community. Parker served three terms as mayor of the nation’s fourth-largest city, the largest ever to have a mayor drawn from the LGBT population, and left office due to term limits. Before that, she spent three terms as city controller and three on the City Council. She received Victory Fund support at each level. Previously, she worked for 20 years in the oil and gas industry, a major part of Houston’s economy. She had a conservative Republican boss – Robert Mosbacher, who was also a member of President George H.W. Bush’s Cabinet and has a lesbian daughter, Dee. Parker was “oil company employee by day, activist by night” in those years, she said. “I was about the most visible lesbian activist in Houston in the 1980s,” she said. Her activism actually goes back even farther; she attended her first LGBT political event in 1975, which was before Moodie-Mills was born. She doesn’t plan to relocate to Washington, although she will be at Victory Fund’s headquarters frequently. The group is involved in campaigns nationwide, and it’s often easier to travel from Houston. Parker shares her home there with wife Kathy Hubbard; they’ve been together for 27 years and married for four. They have four children, the youngest of whom is 22, and one grandchild.